In 1982, the Whiteaker area's newly-formed Neighborhood Economic Development Corporation established the East Blair Housing Cooperative, Oregon's first low-income housing co-op, with 22 varied living units in 10 buildings. Maintenance, membership, and money are handled by committees, important issues get every member's vote at monthly meetings. 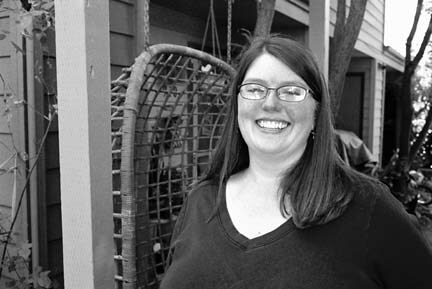 An LA native who moved to Eugene in '91 after college at UCSB, business manager Melanie Sicotte has served as EBHC's only paid employee since 1994. " Everyone here is my boss. It's a part-time job but a full-time commitment," she says. "My basic duty is to do the accounts day-to-day. I'm also an advisor. I do research and know the Oregon statutes. I like being a resource." She credits her partner, Marq Bauman, for his patience and his job at Symantec. Four years after she started at EBHC, Sicotte was recruited for the same position at the Students' Cooperative Association, a campus-area housing co-op that dates back to 1936. "Melanie is the backbone of both co-ops," reports EBHC member Ken Rosemarin.